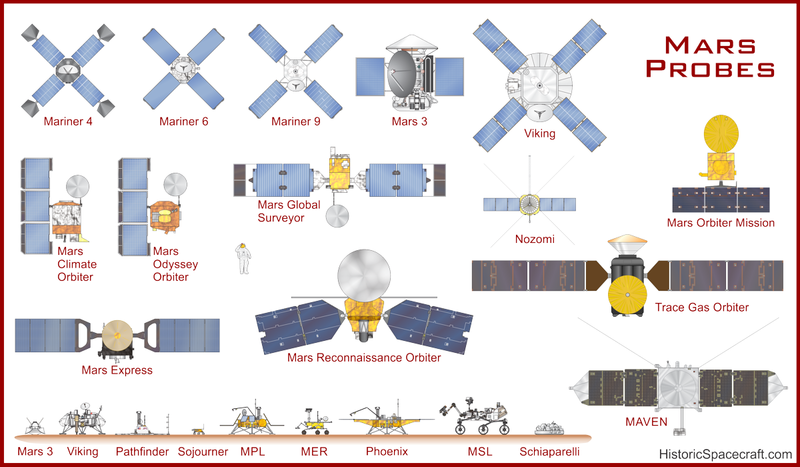 Comparison of several Mars probes. Since the early 1960's, dozens of spacecraft have been sent to explore Mars. The first spacecraft to successfully flyby Mars was the American Mariner 4 spacecraft. 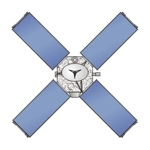 Orbit was first achieved with Mariner 9 in 1971. The mission returned thousands of images, giving us our first global look at the planet. The Soviet Mars 3 mission was the first to land on the surface. Unfortunately, communication ceased shortly after touchdown. The Viking program consisted of two orbiters and two landers. The landers studied many aspects of the surface and conducted sophisticated experiments to search for life. Mars missions have seen frequent failures, but have also some spectacular successes. 1996 saw the launch of Mars Pathfinder and Mars Global Surveyor. The Pathfinder lander tested an airbag landing technique and included the small Sojourner rover. 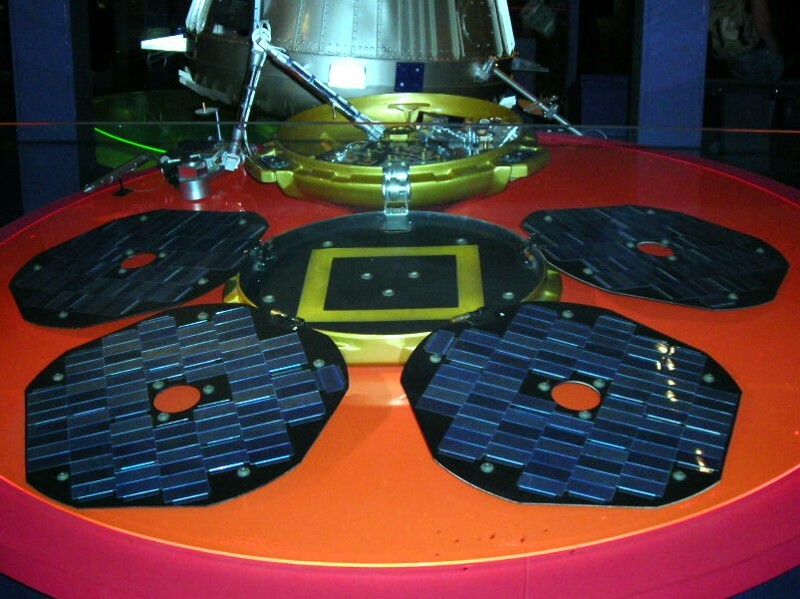 Mars 96, a Russian probe launched the same year, suffered a booster malfunction and fell back to Earth. The success of both Mars Pathfinder and Mars Global Surveyor were to start off a period of frequent missions. NASA planed on launching Mars spacecraft every two years as the planets aligned properly. Disaster struck in 1998. Both the Mars Climate Orbiter and the Mars Polar Lander spacecraft were destroyed upon reaching Mars. The success rate increased in the coming years. 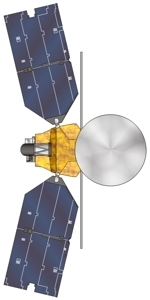 Mars Odyssey, an orbiter launched in 2001, was successful. 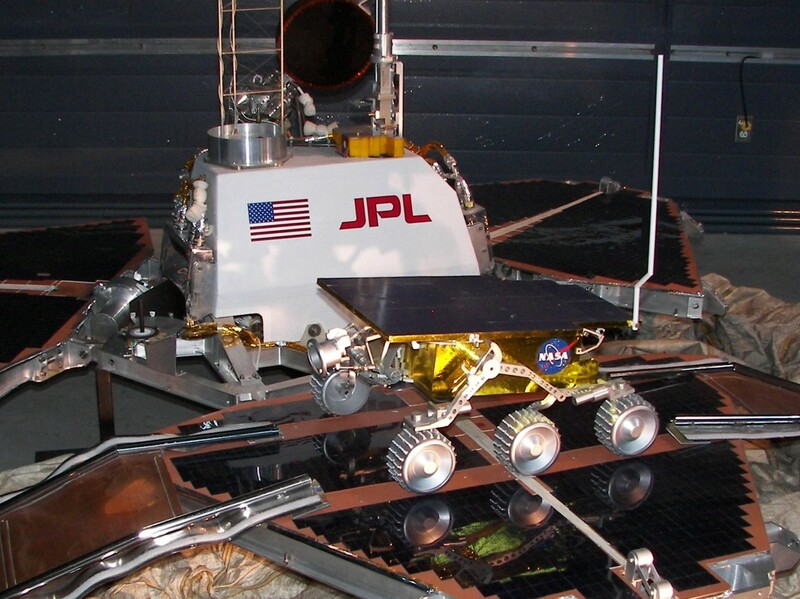 During the 2003 launch window, NASA sent the twin Mars Exploration Rovers to the red planet. 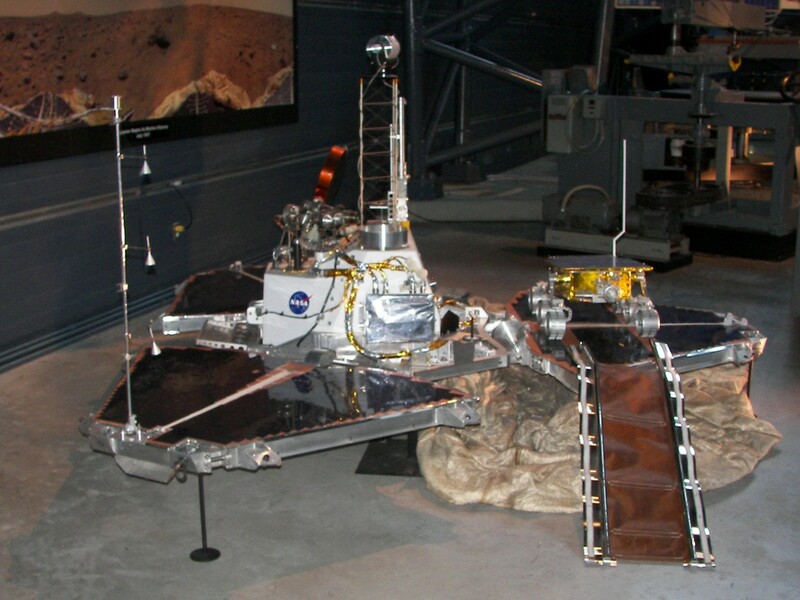 The rovers, known as Opportunity and Spirit, utilized an airbag landing technique similar to that tested on the Mars Pathfinder mission. The rovers both operated for years beyond their 90 day design life. Also launched in 2003 was the European Mars Express mission. 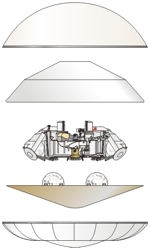 A small lander, Beagle 2, was carried to Mars on the Mars Express spacecraft. The lander failed to contact Earth and might have crashed into the surface. Mars Reconnaissance Orbiter, launched in 2005, has provided high resolution imagery of the Martian surface. The spacecraft's cameras have even captured photos of landers on the surface. The Phoenix Mars Lander, launched in 2007, landed in the polar regions. Equipped with a robot arm, the probe was able to dig into a layer of water ice just centimeters below the surface. Landing in 2012, the large Mars Science Laboratory (MSL) rover carried a more sophisticated array of scientific instruments than recent landers. With power supplied by a radioisotope thermal generator, rather than by solar panels, MSL will be able to travel farther and faster then previous rovers. Still more missions are in the planning stages, including sophisticated rovers and sample return missions. Marsnik 1 1960 Molniya Flyby Failed. Marsnik 2 1960 Molniya Flyby Failed. Sputnik 22 1962 Molniya Flyby Failed. Mars 1 1NOV1962 Molniya Flyby Communications lost before arrival. Sputnik 24 1962 Molniya Lander Failed. Mariner 3 5NOV1964 Atlas-Agena Flyby Failed to reach Mars. Mariner 4 28NOV1964 Atlas-Agena Flyby First successful Mars flyby. 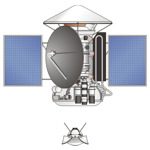 Zond 2 30NOV1964 Molniya Flyby Communications lost before reaching Mars. (Mariner F) 24FEB1969 Atlas-Centaur Flyby Successful. (Mariner G) 27MAR1969 Atlas-Centaur Flyby Successful. Mars 1969A 27MAR1969 Proton rocket Orbiter Launch failure. Mars 1969B 2APR1969 Proton rocket Orbiter Launch failure. (Mariner H) 9MAY1971 Atlas-Centaur Orbiter Launch failure. Mars 2 19MAY1971 Proton rocket Orbiter and Lander Lander crashed. Orbiter was successful. Mars 3 28MAY1971 Proton rocket Orbiter and Lander Lander failed shortly after landing. Orbiter entered orbit. (Mariner I) 30MAY1971 Atlas-Centaur Orbiter Successful Mars orbiter. 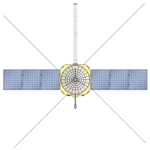 Mars 4 21JUL1973 Proton rocket Orbiter Failed to enter Mars orbit. 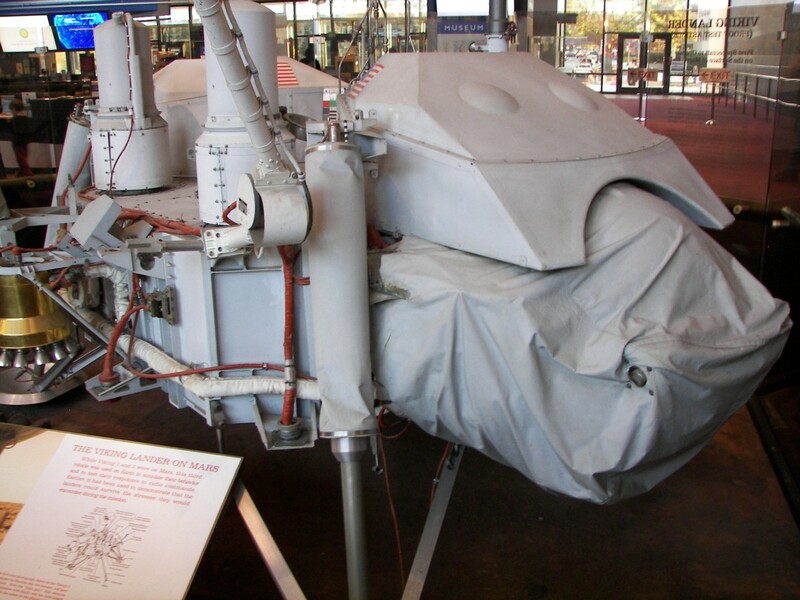 Mars 6 5AUG1973 Proton rocket Lander Returned atmospheric data during descent, but did not survive landing. Mars 7 9AUG1973 Proton rocket Lander Missed the planet. Centaur Mars Orbiter and Lander Successful orbiter and lander. Phobos 1 7JUL1988 Proton rocket Mars orbiter & Phobos lander Probe failed before reaching Mars. Phobos 2 12JUL1988 Proton rocket Mars orbiter & Phobos lander Returned some data from Mars orbit, but failed before lander was deployed. Mars Observer 25SEP1992 Titan III Orbiter Communication failed before reaching Mars. Mars 96 16NOV1996 Proton rocket Orbiter & Landers Launch failure. Nozomi 3JUL1998 M-5 Orbiter Failed to enter orbit. Mars Climate Orbiter 11DEC1998 Delta 7425 Orbiter Crashed into Martian atmosphere. Deep Space 2 3JAN1999 Delta 7425 Mars surface penetrators No contact made. 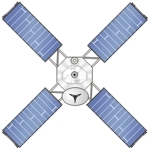 Beagle 2 2JUN2003 Soyuz-Fregat Lander Contact lost prior to landing. Fobos-Grunt 9NOV2011 Zenit Phobos Sample Return Failed to leave Earth orbit. Mars Science Laboratory 26NOV2011 Atlas V 541 Rover Currently operating on Mars. Mars Orbiter Mission 5NOV2013 PSLV-XL Orbiter Currently orbiting Mars. MAVEN 18NOV2013 Atlas V 401 Orbiter Currently orbiting Mars. Trace Gas Orbiter (TGO) 14 March 2016 Proton-M/Briz-M rocket Orbiter Currently orbiting Mars. Schiaparelli Lander 14 March 2016 Proton-M/Briz-M rocket Lander Contact lost prior to landing. InSight 5 May 2018 Atlas V 401 Lander Currently headed toward Mars. Mariner 3 & 4 were intended to conduct flybys of the planet Mars. Each spacecraft was launched on an Atlas-Agena D rocket (right). Mariner 3 was launched on 5 November 1964. A launch shroud failed to separate and the spacecraft was not placed on the correct trajectory. Mariner 4 was launched on 28 November 1964. The spacecraft successfully flew by Mars on 14 July 1965. The mission returned the first close-up images of another planets surface. Mariner 6 & 7 were intended to conduct flybys of the planet Mars. Each spacecraft was launched on an Atlas-Centaur rocket (right). Mariner 6 (Mariner F), was launched on 24 February 1969. The spacecraft successfully flew by Mars in July 1969. The mission returned images of the Martian surface. Mariner 7 (Mariner G) was launched on 27 March 1969. The spacecraft successfully flew by Mars in August 1969. The mission returned images of the Martian surface. Mariner 8 & 9, sometimes known as "Mariner Mars 71", were intended to become the first spacecraft to enter orbit around the planet Mars. Each spacecraft was launched on an Atlas-Centaur SLV-3C rocket (right). Mariner 8 (Mariner H) was launched on 8 May 1971. A failure with the Centaur upper stage resulted in the spacecraft falling back to Earth. Mariner 9 (Mariner I) was launched on 30 May 1971. The spacecraft successfully entered orbit around Mars in November 1971. The successful mission returned thousands of images of the Martian surface. 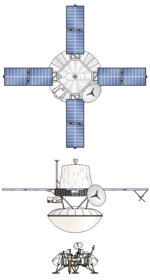 Mars 3 Spacecraft (top) and Lander (bottom). Launched in 1971, the Soviet Mars 2 and 3 missions each consisted of an orbiter and a lander component. Both missions were launched on Proton rockets from Baikonur Cosmodrome. Mars 2 was launched on 19 May 1971. The lander, released shortly before reaching Mars, malfunctioned and crashed into the surface of Mars. The Orbiter portion of the spacecraft entered orbit and returned data for several months. Mars 3 was launched on 28 May 1971. The lander, released shortly before reaching Mars, became the first probe to successfully land on the surface of Mars. Unfortunately, communications with the lander ceased after only a few seconds. The Orbiter portion of the spacecraft entered orbit and returned data for several months. 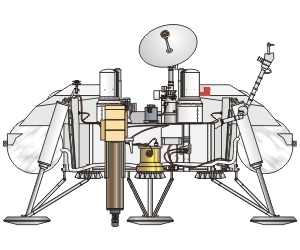 The Viking program consisted of two spacecraft, each with an orbiter and a lander component. Each spacecraft was launched from Cape Canaveral on a Titan IIIE Centaur rocket (right). At launch, the lander was attached to the orbiter. The combined spacecraft would enter Mars orbit. Cameras on the orbiter would begin to image potential landing sites using onboard television cameras. When controllers believed a suitable landing site had been found, the lander would separate form the orbiter and begin its descent into the atmosphere. Because scientists were concerned about bacteria from Earth hitching a ride on the landers, and possibly contaminating the landing site, each lander was carefully sterilized before launch. The sterilized capsule, including heat-resistant areroshell, was encapsulated in a pressurized cocoon known as the bioshield. The bioshield was roughly egg shaped and measured 3.7 m in diameter and was 1.9 m tall. The Viking orbiters were designed to transport the landers to Mars, to aid landing site selection and certification, to serve as a communication link with the landers, and to conduct independent investigations from Mars orbit. The orbiters were based on the successfully flown Mariner 9 spacecraft design. The core of the spacecraft was an octagon structure around 2.5 m across and 1 m tall. Four solar panels extended from the octagon. Attached to one end of the spacecraft was the encapsulated lander. Mounted to the opposite end was the main propulsion unit. The main propulsion unit included a steerable liquid fueled rocket engine fueled with monomethyl hydrazine and nitrogen tetroxide. The engine would be used for Mars orbit insertion and for major course corrections. Each orbiter had a 1.5 m steerable high-gain parabolic antenna, as well as a fixed low-gain antenna. A steerable scan platform mounted several remote sensing experiments, including a pair of television cameras, an atmospheric water detector, and a thermal mapper. After lander deployment, the orbiters continued to observe mars from orbit, imaging the surface and conducting other experiments. Bioshield Cap, Aeroshell Cover, Viking Lander (in stowed configuaration), Aeroshell Heat Shield, Bioshield Base. An aeroshell, measuring 3.5 m in diameter and coated with ablative material, protected the lander during entry into the upper Martian atmosphere. Lower in the atmosphere, a parachute measuring 16 m in diameter was deployed to further slow the descent. A radar altimeter provided altitude data during the descent. A short while later, the aeroshell was jettisoned and the landing legs deployed. 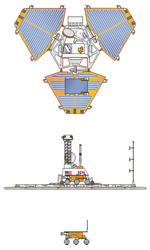 Attached to the lander were three clusters of terminal descent engines. Each cluster of the hydrazine monopropellant fueled engines included 18 small nozzles. The large number of nozzles was designed to better distribute the engine exhaust, and to reduce the disturbance of soil near the landing site. The Viking landers, when fully deployed, measured around 3 m across and 2 m tall. The core of the lander was a six-sided box. The titanium and aluminum box had three 109 cm long sides, and three 56 cm sides. A landing leg was attached to each of the three short sides. Each landing leg had a circular footpad measuring 30.5 cm in diameter. Each lander was powered by a pair of radioisotope thermal generators (RTGs). Communications were made using a parabolic high-gain antenna and an omnidirectional low-gain antenna. Both antennas allowed direct communications with Earth. A UHF antenna, allowing communications with the orbiter, was also available. 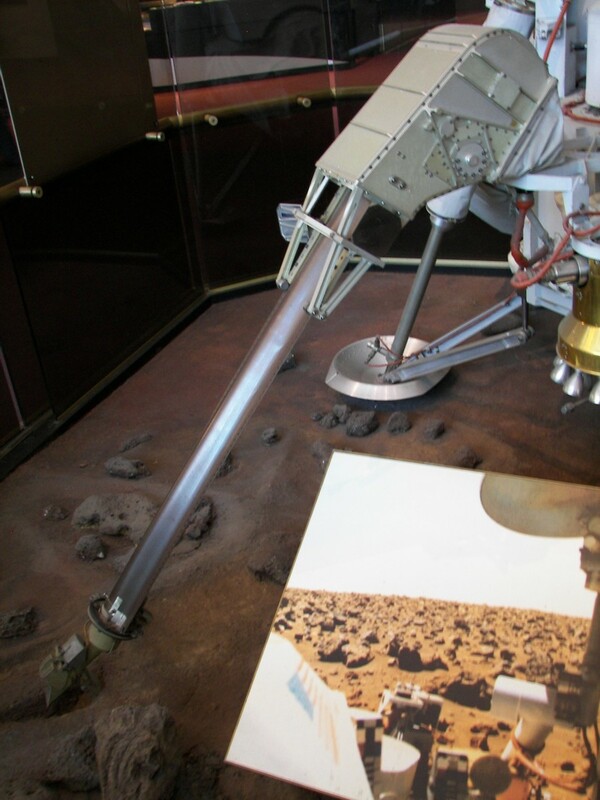 Two cameras and an extendable sampling arm were attached to the lander. A deployable meteorology arm mounted sensors to record temperature, wind speed, and wind direction. 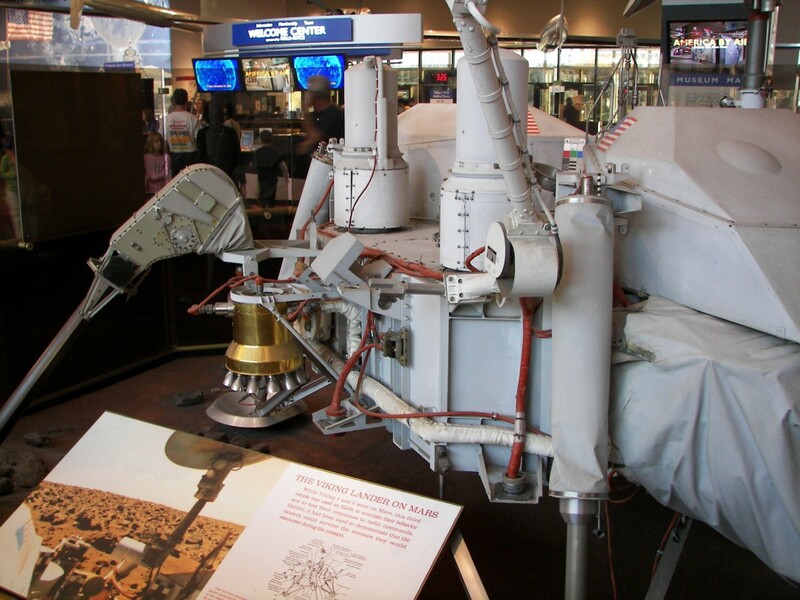 Sophisticated experiments on the lander included a seismometer, a gas chromatograph/mass spectrometer, an X-ray fluorescence spectrometer, and a collection of biology experiments designed to look for signs of life. A biology science package included three experiments. The Gas Exchange Experiment, the Carbon Assimilation Experiment, and the Labeled Release Experiment were designed to find evidence of microscopic life in Martian soil. Each experiment was performed multiple times on different soil samples. The biology experiments gave mixed results, but provided no conclusive evidence that life existed on Mars. Contact was lost with the Viking 1 lander in November of 1982. Operations with the orbiter terminated in August of 1980. The Viking 2 spacecraft launched on 9 September 1975 and entered Mars orbit on 7 August 1976. After selecting a landing site, the lander was released on 3 September 1976. The probe successfully landed at Utopia Planitia. The Viking 2 lander operated until 11 April 1980. The orbiter was turned off on 25 July 1978. Science return from the Viking probes exceeded expectations. The Viking landers returned over 4500 photos from the surface. Viking provided valuable data about weather conditions and soil composition at the landing sites. Amazingly, each of the landers continued to operate for many years. A tribute to the scientists, engineers and craftsmen who designed, constructed, tested, and operated these amazing machines. Phobos 1 and 2 were a pair of Soviet interplanetary spacecraft designed to study the interplanetary environment, the planet Mars, and the surface of the Martian moon, Phobos. Near the end of their missions, each spacecraft was to deploy a pair of landers to land on Phobos. Each mission was launched on a Proton-K rocket from Baikonur Cosmodrome. Phobos 1 was launched on 7 July 1988. Communication with the spacecraft failed in September 1988 before reaching Mars. Phobos 2 was launched on 12 July 1988. The spacecraft successfully entered orbit around Mars in January 1989. Unfortunately, contact was lost in March 1989, before the Phobos landers were released. Mars Observer was launched on 25 September 1992, from Cape Canaveral, on a Titan III rocket (right). Contact with the probe was lost in August 1993. The loss occurred several days before the Mars orbit insertion burn. Investigators believe a fuel line may have ruptured during fuel tank pressurization. No further contact was made with the spacecraft. Mars Global Surveyor was launched on 7 November 1996 on a Delta II 7925 rocket. The spacecraft arrived at Mars in September 1997. The successful mission continued to operate until communication was lost in November 2006. Mars Orbiter Camera (MOC) - Acquired narrow-angle and wide-angle images of weather patterns and surface features. Mars Orbiter Laser Altimeter (MOLA) - Gathered data used to create accurate topographical maps of the surface. Thermal Emission Spectrometer (TES) - Mapped the mineralogical composition of the planets surface. 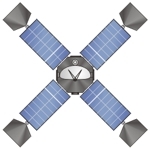 MAGNETOMETER - Gathered data on regional variations in the Martian magnetic field. Gravity Field Experiment - Scientists used signals from the spacecraft as it disappeared and reappeared from behind the planet to study the Martian atmosphere. Mars Relay System - Allows the orbiter to relay data between landers on the surface and controllers back on Earth. Mars Pathfinder lander and Sojourner rover. The Pathfinder mission was designed to demonstrate a less expensive method for landing spacecraft on Mars. The mission also deployed a small rover to investigate the nearby surface. The mission was launched on 4 December 1996 from Cape Canaveral Air Station in Florida. The launch vehicle was a Delta-II rocket (right). Mars Pathfinder cruise stage, heatshield and backshell. Pathfinder successfully landed on Mars on 4 July 1997. 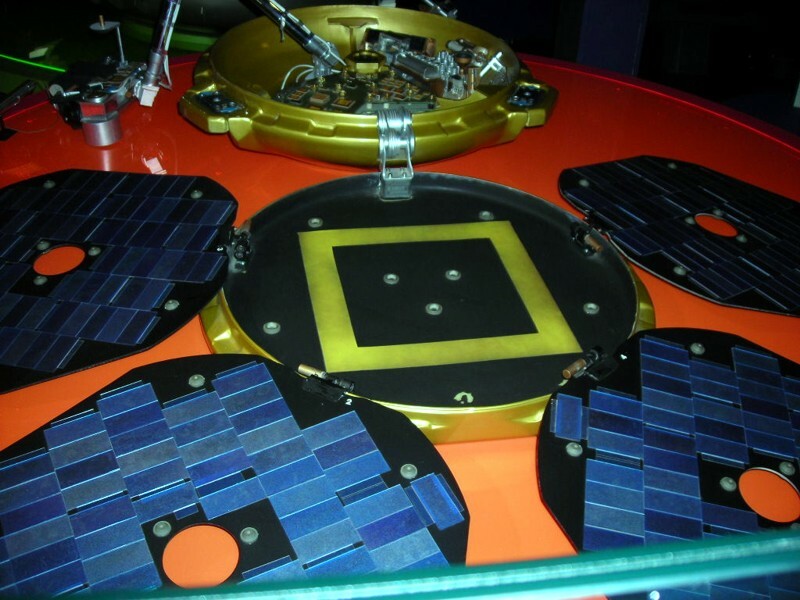 Unlike Viking, Pathfinder did not enter Mars orbit before starting its descent. Instead, the spacecraft entered directly into the atmosphere. A heat shield protected the spacecraft during the early stages of entry. As the velocity slowed, a parachute was deployed. As the velocity slowed more, the heat shield was dropped. Then the lander was suspended from the backshell on a tether. As the spacecraft neared the ground, a number of large airbags inflated, completely covering the folded, four-sided lander. Thrusters fired to cancel out much of the remaining vertical velocity and the tether was cut. The lander dropped the remaining few meters to the Martian surface. The bags protected the spacecraft when it made contact with the rocky ground. After bouncing and eventually coming to rest, the bags deflated and were retracted. By deploying three large petals, the spacecraft opened up and exposed the camera mast, weather station, high-gain antenna, solar panels, and rover. 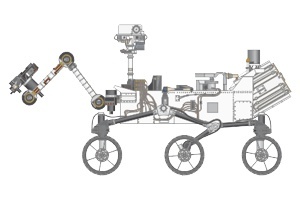 The six-wheeled rover, named Sojourner, was equipped with cameras and an Alpha-Proton-X-ray Spectrometer (APXS). The APXS instrument was used to determine the chemical composition of rocks and soil. The rover was solar powered. The last transmission from the lander occurred on 27 September 1997. The probe had functioned for much longer than required by the mission objectives. The experience gained operating the rover, as well as the successful use of the airbag landing system, proved critical to the later success of the larger and more capable Mars Exploration Rover missions launched in 2003. A Japanese Mars orbiter launched on 3 July 1998 on an M-5 rocket from Uchinoura Space Center, Japan. The original plan was to enter Mars orbit in October 1999. Unfortunately, a problem with the fuel system left the spacecraft unable to reach its planned rendezvous. Mission planners developed a new trajectory that would reach Mars in December 2003, four years later then originally planned. More problems arose and the spacecraft did not enter Mars orbit. Mars Climate Orbiter was designed to study aspects of the Martian atmosphere. The mission was launched on a Delta II 7425 rocket on 11 December 1998 from Cape Canaveral. The spacecraft reached Mars in September 1999, but failed to enter orbit as planned. No further contact was made with the spacecraft. Investigators believe a navigation error resulted in the probe impacting the planets atmosphere and breaking up. Mars Color Imager (MARCI) - An assembly of two cameras, wide angle and medium angle, to image the Martian atmosphere and surface. Pressure Modulator Infrared Radiometer (PMIRR) - Designed to analyze the vertical structure of the Martian atmosphere. Mars Polar Lander was designed to study surface conditions in the southern polar regions of Mars. 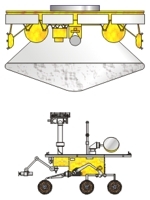 The lander was equipped with a robotic arm to gather samples for analysis. The mission was launched on a Delta II 7425 rocket on 3 January 1999 from Cape Canaveral. The spacecraft entered the Martian atmosphere on 3 December 1999. No contact was made with the lander during descent or after the scheduled landing. The spacecraft is believed to have crashed into the surface. 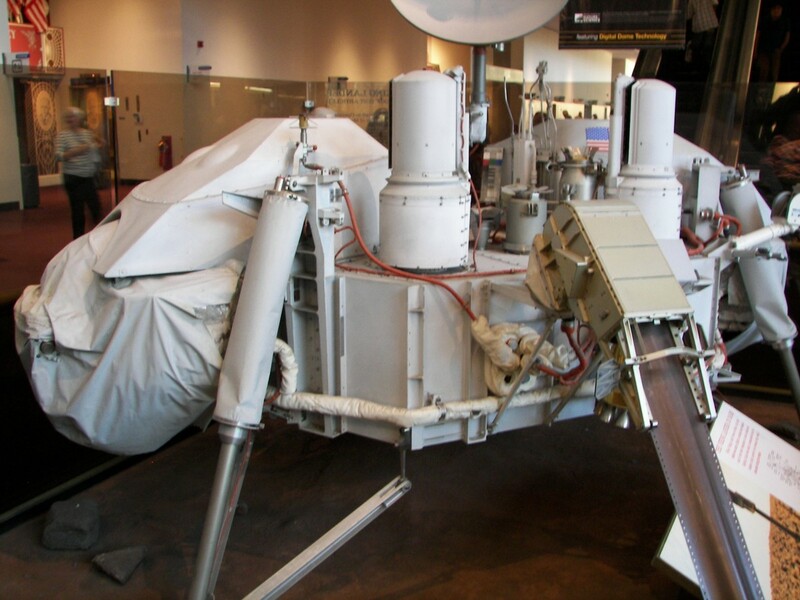 Mars Volatiles and Climate Surveyor (MVACS) - A package of equipment that included a stereo imager, a robotic arm, a weather station, and a gas analyzer. 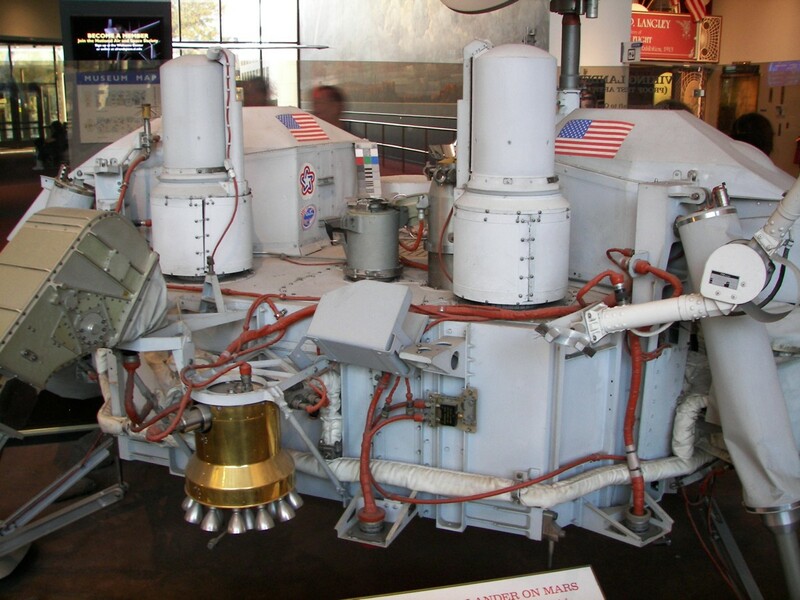 Mars Descent Imager (MARDI) - Designed to take surface images during the landers descent. Light Detection and Ranging (LIDAR) - Designed to study particles in the Martian atmosphere. A pair of small probes, designed to penetrate the surface and analyze subsurface conditions, were transported to Mars attached to the Mars Polar Lander spacecraft. The probes were known as Deep Space 2. No contact was made with either microprobe at Mars and are believed to have been destroyed. The American Mars Odyssey orbiter was launched on 7 April 2001 on a Delta II 7925 from Cape Canaveral. The goal of the mission was to study the mineralogical composition of the planets surface and to investigate the radiation environment near the planet. The spacecraft arrived at Mars in October 2001 and continued to operate after successfully completing its primary mission in 2004. 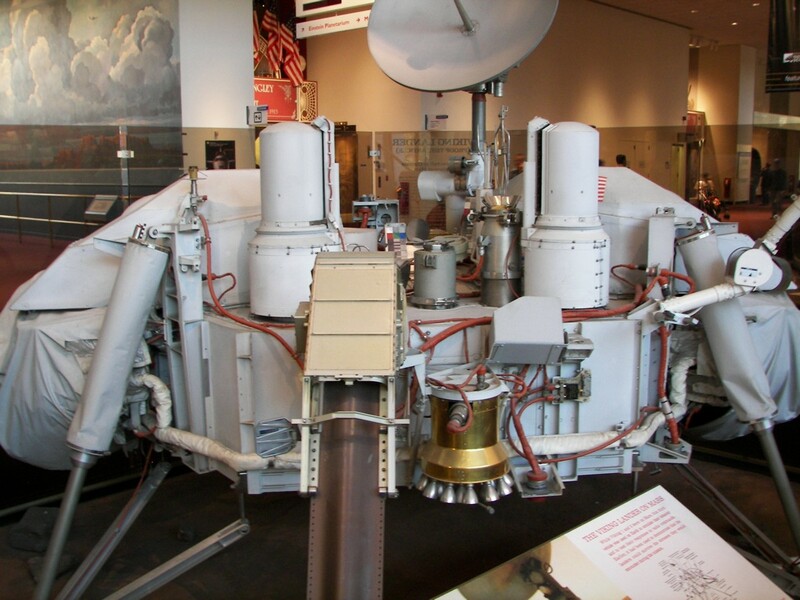 Mars Odyssey carried three scientific instruments. Mars Radiation Environment Experiment (MARIE) Measures the radiation environment near Mars. Thermal Emission Imaging System (THEMIS) Measures the mineralogical composition of the surface. Gamma-Ray Spectrometer (GRS) Gathers information about the elemental composition of the surface. The instrument can also measure the amount of hydrogen near the planets surface. The European Mars Express mission was launched on 2 June 2003. Liftoff took place from Baikonur Cosmodrome on a Soyuz-Fregat rocket. The spacecraft entered Mars orbit in December 2003. On 19 December 2003, Mars Express released the Beagle 2 lander. No contact was made with the lander after the scheduled landing. 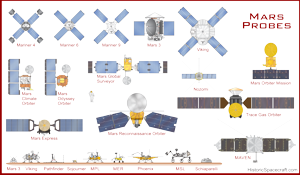 The Mars Express spacecraft continues to study Mars using a variety of instruments. Visible and Infrared Mineralogical Mapping Spectrometer (OMEGA) - Maps the mineral composition of the planets surface. Mars Advanced Radar for Subsurface and Ionospheric Sounding (MARSIS) - Gathers data on the subsurface structure of the planet. Mars Radio Science Experiment (MaRS) - Uses radio waves to gather information about the Martian ionosphere, atmosphere, surface, and interior. Spectroscopic Investigation of the Characteristics of the Atmosphere of Mars (SPICAM) - Gathers data on the composition of the Martian atmosphere. Planetary Fourier Spectrometer (PFS) - Gathers data on the composition of the Martian atmosphere. Analyzer of Space Plasmas and Energetic Atoms (ASPERA) - Gathers data on the composition of the Martian atmosphere. 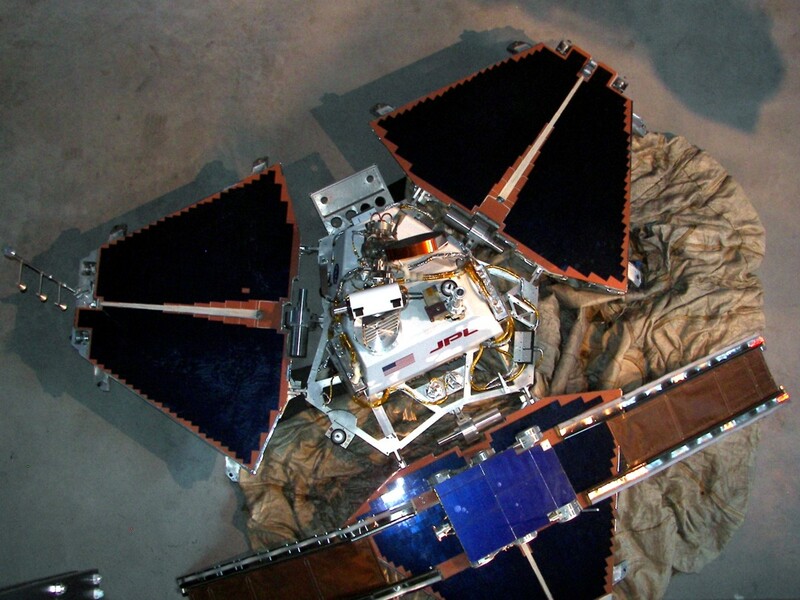 Launched with the Mars Express orbiter in 2003, Beagle 2 was designed to land on Mars. It's mission was to search for signs of present or past life on the surface. Unfortunately, no confirmation of landing was received. All attempts to contact the Lander failed. The United States launched a pair of Mars Exploration Rovers in 2003. The spacecraft used the airbag landing technique first used on the Mars Pathfinder mission. A major goal of the mission was to search for evidence of past water activity. Each rover landed successfully and operated for far longer then their design life of 90 days. Spirit was launched on a Delta II 7925 rocket on 10 June 2003 from Cape Canaveral. Spirit landed on 4 January 2004 at Gusev Crater. The rover operated until 2010, far exceeding its design live of 90 days. Opportunity was launched on a Delta II 7925H rocket on 7 July 2003 from Cape Canaveral. The later launch of Opportunity required a more powerful rocket then Spirit needed. Opportunity landed on 25 January 2004 at Meridiani Planum . The mission has proved highly successful and the rover continues to operate. Panoramic Camera (Pancam) - A pair of high-resolution cameras mounted on a mast. The cameras can pan and tilt to image the surrounding surface and sky. The cameras are fitted with filter wheels and can capture multispectral and color images. Microscopic Imager (MI) - Located on the robotic arm, this device can take microscopic images of rock and soil samples. Miniature Thermal Emission Spectrometer (Mini-TES) - An infrared spectrometer that determines the composition of rocks and soils by analyzing their thermal radiation patterns. Mössbauer Spectrometer (MB) - A spectrometer designed to analyze iron-bearing minerals. Alpha Particle X-Ray Spectrometer (APXS) - A spectrometer used to analyze the composition of rock and soil samples. Rock Abrasion Tool (RAT) - A small grinder, located on the robotic arm, that can grind away the weathered outer layers of rocks, exposing a cleaner surface for further investigation using the rovers other instruments. The Mars Reconnaissance Orbiter is equipped with an array of scientific instruments to gather information about the history of water on Mars. The spacecraft can also serve as a communication relay to and from landers and rovers. The Mars Reconnaissance Orbiter was launched on an Atlas V-401 rocket from Cape Canaveral Air Force Station, Florida. Liftoff occurred on 12 August 2005. The spacecraft measures around 13.6 meters from one solar panel tip to the other. A 3 meter high-gain antenna allows high volumes of data to be transmitted to Earth. MRO entered Martian orbit on 10 March 2006. The spacecraft continues to operate. MRO carries six scientific instruments. Three cameras, an atmospheric sounder, a subsurface sounding radar, and an imaging spectrometer. High Resolution Imaging Science Experiment (HiRISE) The largest telescopic camera sent to another planet, HiRISE is capable of resolving surface details smaller then a meter in size. Context Camera (CTX) - Captures wide-area images to provide context for the high resolution images. Mars Color Imager (MARCI) - Used to image weather features such as clouds and dust storms. Compact Reconnaissance Imaging Spectrometer for Mars (CRISM) - A spectrometer used to identify minerals on the surface. Mars Climate Sounder (MCS) - Observes characteristics of the Martian atmosphere. Shallow Subsurface Sounding Radar (SHARAD) - Looks for signs of water ice below the Martian surface. Phoenix was launched on 4 August 2007 on a Delta II 7925 rocket from Cape Canaveral Air Force Station, Florida. Phoenix successfully landed in the northern polar region of Mars on 25 May 2008. The spacecraft conducted analysis of soil and ice samples collected with a robotic arm. In addition to a robotic arm, the lander included the following experiments. Microscopy, Electrochemistry, and Conductivity Analyzer (MECA) - Measures the properties of soil samples. Robotic Arm Camera (RAC) - Mounted near the scoop at the end of the Robotic Arm, the RAC acquires close-up images of the Martian surface. Surface Stereo Imager (SSI) - Acquires high-resolution, stereo, panoramic images of the surrounding area. Thermal and Evolved Gas Analyzer (TEGA) - Analyzes the composition of up to eight soil and ice samples. 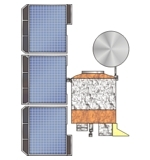 Meteorological Station (MET) - Collects weather data near the lander. Mars Science Laboratory (MSL), also known as Curiosity, successfully landed on Mars on 8 August 2012. The rover carries a sophisticated suite of instruments designed to look for evidence of conditions capable of supporting microbial life, now or in the past, on the planet Mars. MSL is the largest and most capable rover to explore the red planet. The six wheel drive rover was designed to operate for at least one Martian year (687 Earth days). Power is provided by a Radioisotope Thermoelectric Generator, or RTG. The RTG generates both electricity and heat from the radioactive decay of plutonium-238. A 5 degree-of-freedom robotic arm is mounted on the front of the rover. A turret, on the end of the arm, includes several instruments for analyzing and collecting samples. In addition to a spectrometer and an imaging instrument, the turret includes a brush, drill, scoop and sieves. A mast, extending approximately two meters above the planets surface, supports several cameras and experiments. Mast Camera (Mastcam) - A pair of cameras mounted on the mast, approximately two meters above the planets surface. Each camera has a different fixed focal length. The cameras are equipped with a variety of filters and are capable of taking color images. Chemistry & Camera (ChemCam) - The ChemCam consists of two components. The Induced Breakdown Spectrometer (LIBS) uses laser pulses and a spectrometer to remotely gather elemental composition data on rock and soil samples within several meters of the rover. The Remote Micro-Imager (RMI) serves as a context imager for the LIBS instrument. The ChemCam is mounted on the mast. 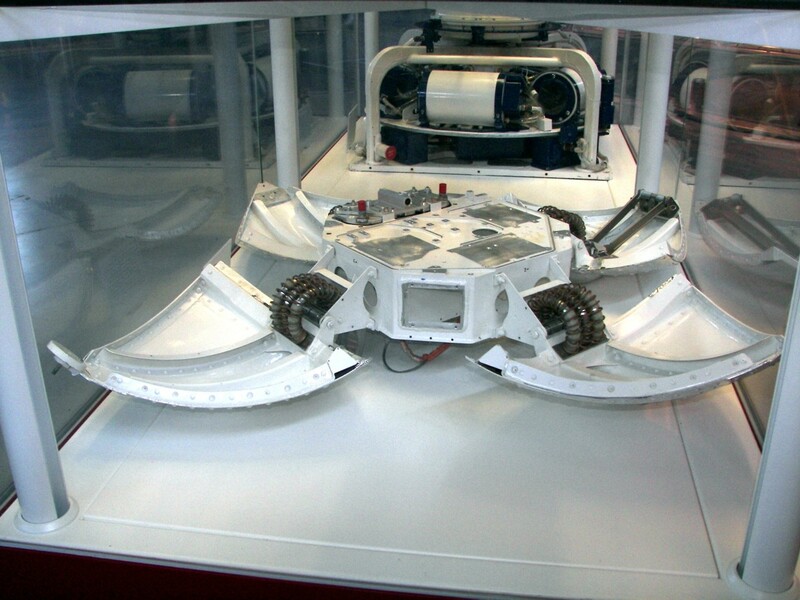 Alpha Particle X-ray Spectrometer (APXS) - Mounted on the robotic arm turret, the APXS is a spectrometer capable of determining elemental chemistry of rock and soil samples. Less capable versions of this experiment equipped the earlier Sojourner and Mars Exploration Rovers. Mars Hand Lens Imager (MAHLI) - A camera imager capable of close-up, high resolution, color images of rock and soil samples. The imager is mounted on the robotic arm turret. Mars Descent Imager (MARDI) - A downward pointing color video camera that will image the area around the landing site as the rover descends to the surface. The data gathered will be used to identify local terrain features and to help plan an exploration strategy. Radiation Assessment Detector (RAD) - An instrument to detect various forms of high-energy radiation near the Martian surface. Information gathered will be used to better understand the radiation levels that future human Mars missions will encounter. Dynamic Albedo of Neutrons (DAN) - Funded by Russia, the DAN experiment will measure hydrogen concentrations beneath the surface. Detected hydrogen might indicate the presence of water. Chemistry & Mineralogy X-Ray Diffraction/X-Ray Fluorescence Instrument (CheMin) - Will be used to identify and measure concentrations of minerals in Martian rock samples. 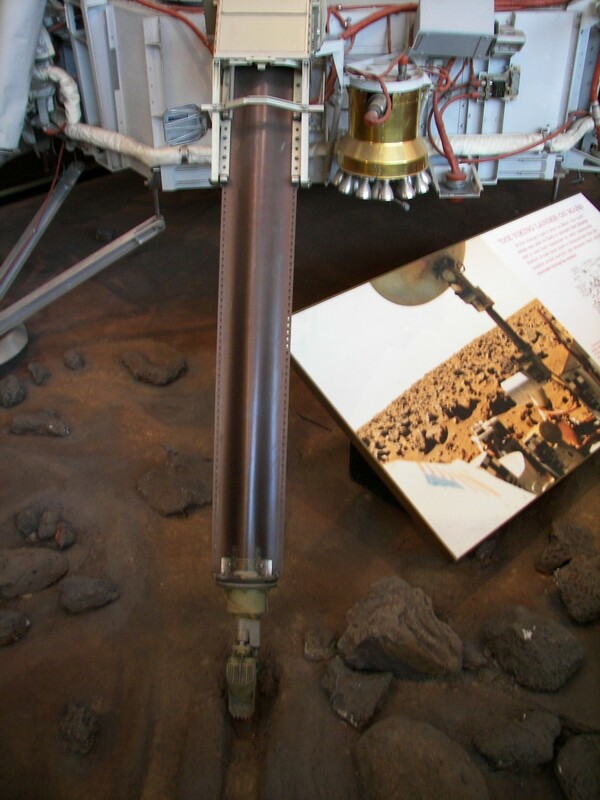 Sample Analysis at Mars (SAM) - The SAM is a suite of sophisticated instruments designed to analyze soil and rock samples collected from the surface and delivered to the instruments. Included within the SAM is a mass spectrometer, a tunable laser spectrometer and a gas chromatograph. MSL launched on an Atlas V 541 launch vehicle (right). The rocket lifted off from launch complex 41 at Cape Canaveral Air Force Station in Florida on 26 November 2011. The Atlas V 541 includes an Atlas V core, four solid rocket motors, and a Centaur upper stage. MSL began it's descent into the Martian atmosphere encapsulated in an aeroshell and heat-shield. As the spacecraft entered thicker atmosphere, a parachute deployed to slow the descent rate. Near the surface, the parachute and aeroshell separated from the spacecraft. A structure, mounted above the rover, fired several rockets that further slowed the descent rate. As the surface neared, the rover descended on a tether and was gently lowered to the ground as the rocket propelled "sky crane" hovered above. Once on the surface, the tether was cut and the hovering structure flew away and impacted the surface a safe distance from the rover. The rover, safely on the surface, began testing systems and deploying instruments. The United States had previously operated three rovers on Mars. 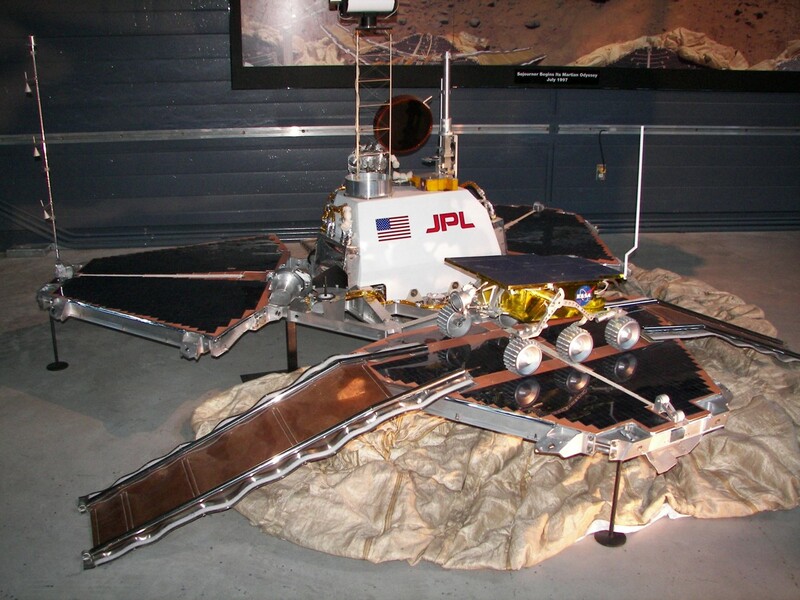 The first rover, known as Sojourner, was part of the highly successful Mars Pathfinder mission launched in 1996. The solar powered rover spent several months exploring near the Pathfinder lander. The twin Mars Exploration Rovers, known as Spirit (MER-A), and Opportunity (MER-B), were launched on separate Delta II rockets in 2003. 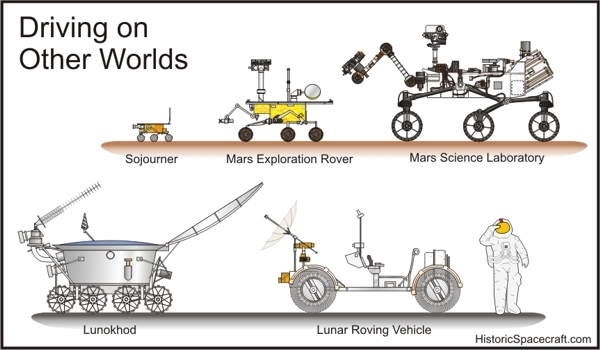 Each rover successfully landed on the red planet in January of the following year. The rovers, designed to operate for three months on Mars, far exceeded their design life. Spirit operated for around six years. Opportunity continues to operate, nearly eight years after landing. Five rovers have operated on the lunar surface. 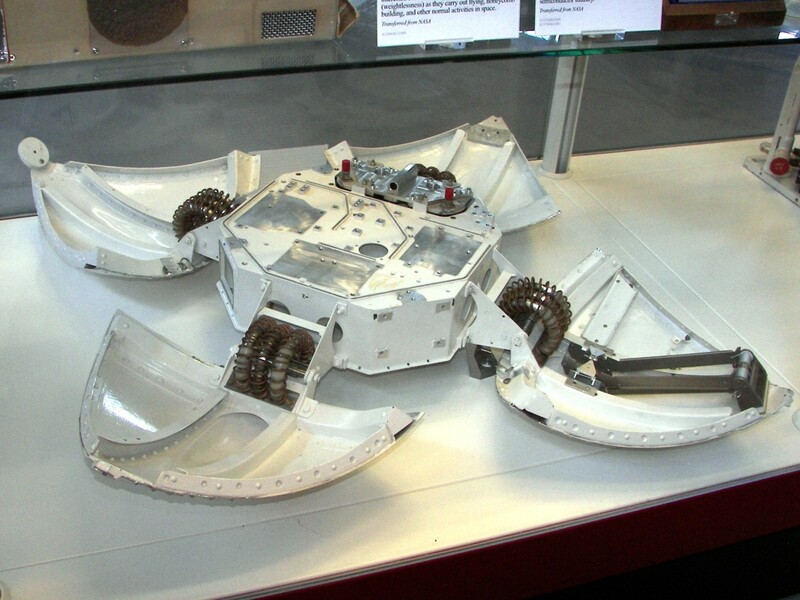 Two unmanned rovers, known as Lunokhod 1 and 2, were operated by the Soviet Union during the early 1970's. 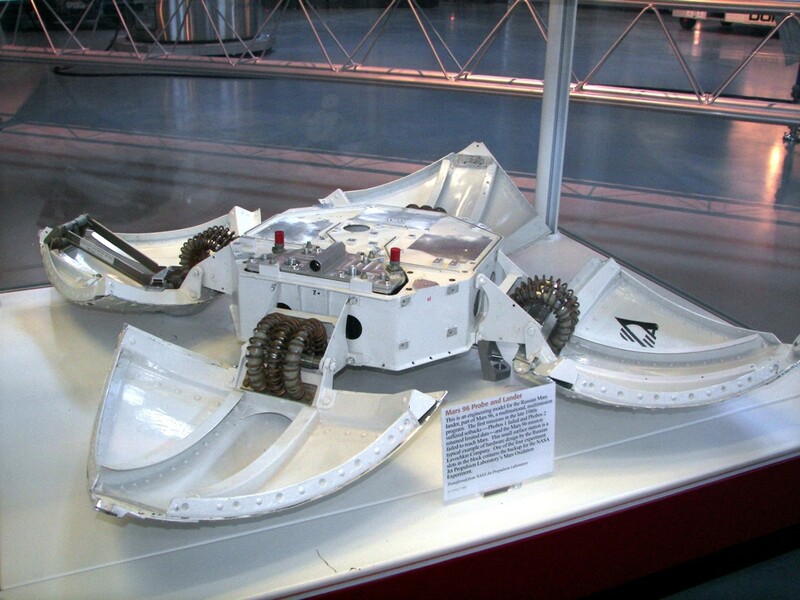 The Lunokhod rovers were remotely controlled by engineers on Earth. The last three Apollo lunar missions each included a Lunar Roving Vehicle, or LRV. The battery powered LRV was designed to transport two astronauts on traverses of up to several kilometers from the lunar module. Mars Science Laboratory Website, NASA Jet Propulsion Laboratory. Mars Science Laboratory Fact Sheet (PDF), JPL 400-1416, 2011. The Mars Orbiter Mission (MOM) represents India's first mission to another planet. The spacecraft was developed by the Indian Space Research Organization (ISRO). 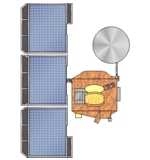 The mission was launched in November 2013 on a PSLV-XL rocket. The spacecraft has been orbiting Mars since September 2014. ISRO's Mars Orbiter Mission website. NASA's MAVEN (Mars Atmosphere and Volatile EvolutioN) spacecraft was designed to study the atmosphere of Mars. The spacecraft has eight scientific instruments and is capable of relaying data between surface rovers and Earth. MAVEN was launched on 18 November 2013 from Space Launch Complex 41 at Cape Canaveral Air Force Station. The launch vehicle was an Atlas V rocket. The spacecraft entered Mars orbit in September 2014. 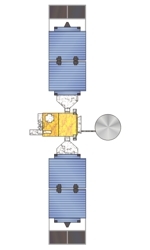 ExoMars Trace Gas Orbiter spacecraft. The Trace Gas Orbiter Mission (TGO) is part of the ExoMars program. The orbiter will study trace gasses, including methane, in the Martian atmosphere. The mission was launched on 14 March 2016 on a Proton-M/Briz-M rocket and sucessfully entered Mars orbit in October 2016. Accompanying the orbiter was the Schiaparelli Lander. Schiaparelli was a technology demonstration spacecraft designed to make a controlled landing on the Martian surface. All communication with the lander was lost shortly before the planned landing time. ExoMars Trace Gas Orbiter website. The InSight lander carries instruments to study the interior of Mars. The mission was launched on 5 May 2018 on a Atlas V 401 rocket. The launch occured at Vandenberg Air force Base, launch complex SLC-3E. NASA Mars InSight Mission page.